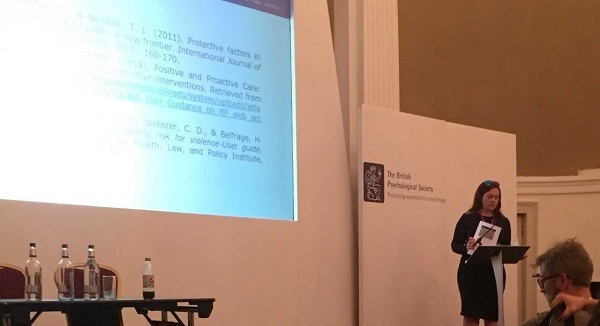 Katie Timmins discusses her experiences of being a Trainee Forensic Psychologist. From presenting at the BPS Conference and pursuing her Research Interests, through to taking part in an ‘Inspire me’ event for aspiring undergraduates at Leeds Beckitt University. Being a trainee on the DForenPsy can be difficult. There are some days where you feel elated when everything is going to plan, then there are others were everything seems impossible. You’ll have people saying “I bet you can’t wait to be a doctor” or “It’ll be worth it in the end”. But in that moment when you have several deadlines to meet, the responsibilities of being on placement, along with all of life’s commitments that seem to want to test you when you need it the least; those statements seem to fade in to the background. However, as I approach the end of my third year, I can honestly say that even though it has been difficult and I have even questioned my competency at times, all the hard work has been worthwhile. It’s been my dream for years to become qualified and this remains my motivation. The course requires you to fulfil academic elements (conducting a primary and secondary piece of research, performing a psychometric critique, and undertaking a systematic review) alongside the practical components (delivering a training package, producing a case study, writing four placement reports and diaries). I have viewed this as a good opportunity to make a difference and contribute to the field of Forensic Psychology. Starting with my mission to address the problematic issues around both the reliability and validity of violence risk assessments, and their administration in applied practice (speaking from experience having done every job under the sun, including: Support Worker; Occupational Therapy Assistant and Assistant Psychologist). In doing so, I feel like I have found a ‘niche’ that I hope to pursue as I go forwards in my career given the importance of risk assessment and management for our clients and organisations affiliated with healthcare. Moving away from the ‘obligations’ of the course, I have also used my role as a Trainee Forensic Psychologist to seek opportunities to meet my individual goals of personal and professional development. For example, for a long time I have avoided speaking to large audiences and giving presentations. Partly through a lack of confidence, but also through the fear that I would be perceived as an ‘imposter’ (and a fraud). So when the Employer Engagement Team at Leeds Beckett University (where I started out) asked if I would like to come and showcase my route to qualification to all the budding undergraduates, I jumped at the chance (watch me here!). Subsequently, this was good practice for when I presented at the BPS conference. So all I would say is to all those who are thinking about applying for the course or are currently on it, you can do it and don’t let anyone tell you it can’t be done. It might just take a lot of resilience, perseverance, and knowledge that you could be the one to make a difference. Katie is supervised by Dr Vincent Egan, Associate Professor in Forensic Psychology Practice, Faculty of Medicine & Health Sciences, University of Nottingham.